it was a beautiful sunrise over the West Maui mountains as one by one Turnagain, then Salient, then Kraken appeared on the horizon and made their way into Pailolo Channel between Maui and Molokai. 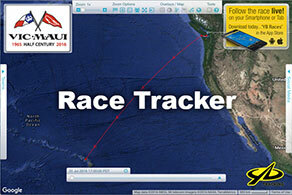 What a great race to watch from shore as the boats converged overnight onto the same line for Maui. Salient had been closest to Maui for most of the race, but had worked on a course to the west of the other two and had to head up to close with the entrance to Pailolo Channel. And lose a little of her lead every hour. And later in the afternoon, Kraken even reported being close enough to send their drone over to photograph what Turnagain was up to (note that there are no fishing lines deployed). 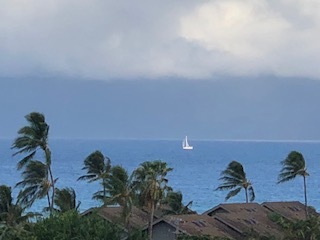 But as night fell, all 3 boats charged onward to Maui in essentially a 3 boat match race. It is almost inconceivable that after 2400 miles and 2 weeks of round-the-clock sailing, these competitors were that close - closer than they would finish in many local races back home. With their finish after time allowances are taken into account, it looks like Salient will win Racing Division 2, with Kraken placing 2nd. But no matter, all were very happy to hit the dock and celebrate with friends and loved ones.